Uniseal fittings are a great inexpensive alternative to using bulkhead fittings. Can plumb round tanks. The Value packs are designed to let you get the most for your money by sizing the packages to fit in USPS Flat Rate shipping options. I always shake my head when some one orders just one or two of the smallest fittings and they are paying more for the postage than they paid for the fittings and then a week or two later they order a few more. So with this product I am essentially suggesting How many of any one size I can easily fit into a flat rate envelope. If you still want to order smaller numbers of uniseals, you can do so on the Uniseal page. Plumbing through tank walls is made much easier and less expensive using a Uniseal®. Unlike bulkhead fittings a Uniseals can handle slight irregularities or curvatures without leaking. With a sturdy backing, a Uniseal® can even be plumbed through liner. Bulkhead fittings often have limited connection options and force the use of extra threaded fittings to connect the pipes. Bulkhead fittings usually cost more than Uniseals. Cut hole to the proper size for the Uniseal you are using. Insure that the hole is clean cut with no sharp edges. 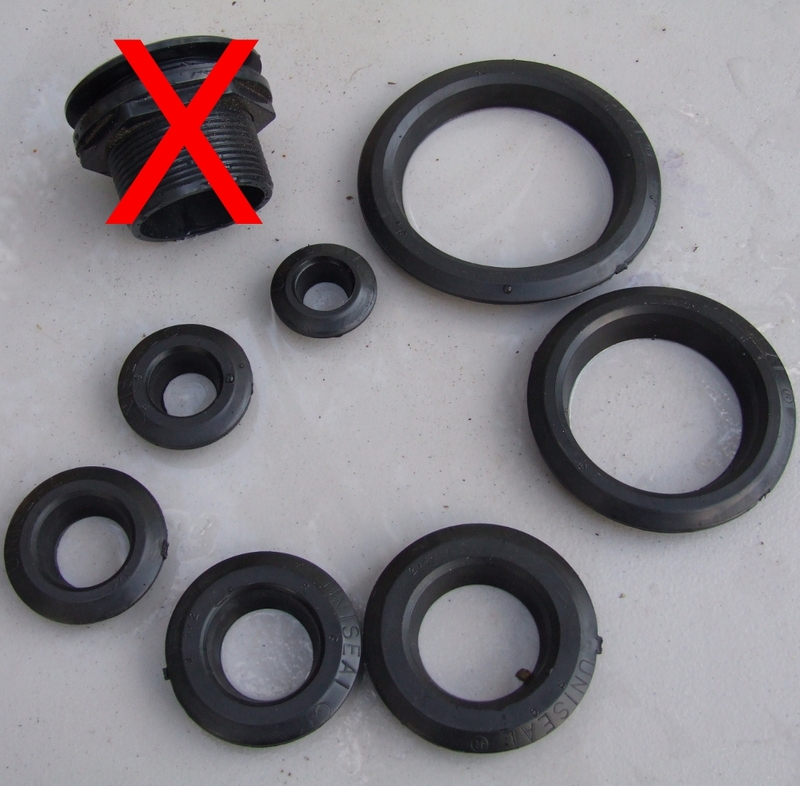 Irregularities could cause poor sealing and ultimate leakage. Insert the Uniseal into the hole with the wide side facing the pipe to be inserted. Make certain that the pipe end to be inserted is clean cut. sand the edges so that there are no sharp points. 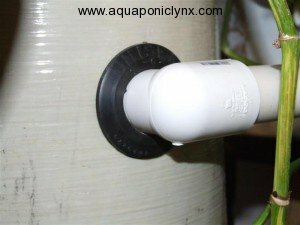 Using rubbing alcohol or slimy water, lubricate the outside of the pipe end to be inserted (the manufacturer recommends detergent and even Aquatic Eco systems says windex but both these could be bad for the fish so I usually just use water or rubbing alcohol since it will evaporate,) then push the pipe through the Uniseal from the large flange side. The co-efficient of friction of the rubber holds the pipe tightly in place. A Uniseal® can even be plumbed into a pipe, but the pipe having the Uniseal® hole cut in it must be enough larger than the Uniseal® being installed that it will still seal properly. Sizes listed are the pipe sizes the Uniseal® work with. 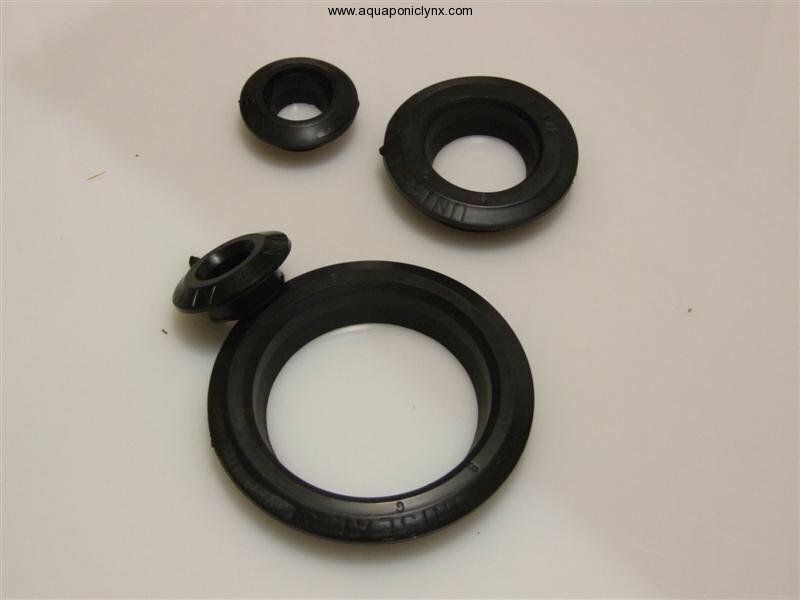 For Example, if you are using 1″ Schedule 40 pipe or PVC drinking water pipe, then you want the 1″ uniseal. I also list the size hole saw needed to cut the proper hole for each size uniseal. Pipe sizes listed are the “Nominal” pipe sizes that match the Schedule 40 PVC Outside Diameter here in the USA where the Uniseals are made. The “Nominal” size does not indicate the outside diameter of the pipe. Pipe sizes are NOT the same world wide. While it seems the pipe sizes in the USA and Australia are compatible some parts of Europe are NOT and I do not know where else. Please do some research into pipe sizes before ordering. I do not refund the shipping or pay for the return shipping on uniseals since it normally costs more to ship them than it costs for the parts themselves. I’m already selling the Uniseals about as inexpensively as I can afford to. But if you are in the united states, the shipping on 20, 3″ uniseals is reasonable enough since I can fit them into a USPS Medium Flat Rate Box and if paypal overcharges you on the shipping, I will refund the difference. I am in Israel and our pipes have different measurements. Can you tell me what outside diameter pipes I can use? For example, I want to use something that has 2 inch od. What uniseal do I use? So too, 1.5 inch od? The Uniseals are made to work with the standard size PVC pipes here in the USA. I don’t know what the pipe sizes are in Israel. When will you have the 1.5 uniseals in stock? Can you give me a quote on 1/2 value packs of 3/4″,1″,1 1/4″. Does that equal 1 1/2 packs? I am just getting started and could use the help. I don’t sell partial value packs since the amounts are based on how many of a particular size I can fit in a flat rate envelope so mixing and matching doesn’t equal a value pack and the different uniseals cost different amounts so it doesn’t make sense to sell 1 1/2 value packs of mixed varieties. If I can ship the uniseals for less than what paypal charges for the shipping, I refund the difference in the shipping price. which european countries have disimilar pipe sizes? pipe bought in asia has been snug! I don’t know, I don’t have the funds to go on a European trip to check it out. Snug is actually good, it should actually be fairly difficult to push the pipe into the uniseal, the bigger sizes the harder it is to install them, smaller sizes are not that difficult. Have had 5 out of 12 seals spring a leak after nearly a year of use. Seems they dont like being moved around at all after being set in place for a time. sorry, nearly 2 years of use!! no bulkhead fitting is designed to handle lots of torking or pressure against the pipe, especially the uniseals which depend on the pressure of the pipe pushing the uniseal against the tank wall for it’s seal. All plastics will become less flexible with age and sun light exposure. Over a year with no leaks! I went through SO MUCH silicon over the years ‘fixing’ dripping bulkheads, what a waste of so many hours and so much money! not to mention the prolonged stress! Do you know when you’ll get 2″ unseals value packs back in? I would want 4 packs. I do not have an eta yet for the 2″ uniseals. Budget is tight having just dealt with taxes. Can we “prepay” for the 2″ unseals and get them sooner? I need 1 6-pack of them. If you need them ASAP, go ahead and order them elsewhere as I’m not sure when I will be able to re-stock yet.